Florida flyfishing charters guided trips in Sarasota. On the Fly Sightfishing by wading or from the boat is a popular way to fly fish the flats. Trout, redfish, snook, pompano, bluefish, Jacks, ladyfish and cobia will all take the fly. You will be using an 8wt Loomis GLX rod with floating line. Wading boots and flies are supplied. Fly patterns include clousers, bendbacks, poppers, deceivers, and of course some redfish Joe's. When stalking redfish or snook in skinny water, wading is recommended. Most of these fish are available year round. Tarpon are plentiful off our beaches in May, June and July. We leave the dock at 6:00 am and are in position when dawn breaks. The only other sight which can compare to the pinks and blues of the sunrise is spotting that first school of tarpon along the beaches. You will be casting a GLX 12wt with slow sinking line. Generally its a moderate cast of 50 feet or less. As the fish approach the boat is kept at bay by your skilled Captain and the use of an electric trolling motor. Most of the time the fish are up and this is extremely exciting fishing. 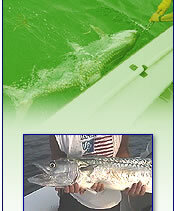 Tarpon are usually in schools of 25-100 fish and range from 50 to 120 lbs. Fly's supplied. Want to learn how to tie an award-winning Snook Alley Fly, Click Here! Night snook fishing is an excellent way to catch quality fish with a fly rod. You will be fishing Venice Florida's famous Snook Alley. It's no secret snook feed well at night, and no wonder they like a small white minnow patter I tie. The snook are schooled up on lighted docks. This also is good sightfishing as you will see the fish turn on your fly just before they strike. This is similar to stream fishing where a dead drift is sometimes important. These will all be quality fish from 3-5 lbs and you can expect to catch between 10-30 fish in an evening. A 6-8 wt rod is ideal and I use both floating and sinking lines. Don't wait - Contact Reel Dreams today! Don't let this one get away!